Fr. Peter Stratos, is currently the head pastor for Saint Anthony Greek Orthodox Church in Pasadena, California. Reverend Peter Stratos was born on May 25th, 1957 to his parents Peter and Alice Stratos in Charlottesville, Virginia. He was raised their, being the oldest of four children. He has one sister Theodora, and two brothers Gregory and Christopher. He attended local schools and was a very active member at the Transfiguration Greek Orthodox Church. From the early age of six, Fr. Peter was an altar boy and a permanent fixture in God’s sanctuary. His faithful grandmother Eleni had a very positive influence on her grandson and patiently taught him the importance of prayer and memorizing and reciting the Lords Prayer (Pater Imon) and the Creed (Pistevo) as a young child. His loving parents also insisted that he attend church every week because they valued worship to God and its importance in their young children’s lives. Fr. Peter completed and graduated from High School in June of 1975. In September of that same year he attended Elon College in North Carolina and graduated in 1980 with a Bachelor of Arts Degree in Political Science. After college he worked for numerous years in Food Service Management, and for four years as Senior Loan Officer in the Mortgage Banking Industry. In 1991 Fr. Peter’s work transferred him to Orange County, California, where he quickly became an active member of St. Paul Greek Orthodox Church in Irvine. During his years at the churches of the Holy Transfiguration in Charlottesville, and St. Paul in Irvine he continually served in the altar, sang in the choir, chanted and served for many years on the Parish Council. It was at St. Paul’s OCF that he met, fell in love with, and on June 26th of 1993 married his devoted wife Presbytera Aida. On February 29th, 1996, their first son Peter Constantine was born. In August of that same year, the family embarked on a life changing decision. With the blessings of both Reverend George Stephanides, of blessed memory and Metropolitan Anthony, of blessed memory, Fr. Peter enrolled at Holy Cross School of Theology in Brookline, Massachusetts to study for God’s Holy Priesthood. And with their small baby the couple moved to Massachusetts. On July 30th, 1998 their second son Nicholas Theodore was born in Boston. In May of 2000 Fr. Peter graduated with honors from Holy Cross Greek Orthodox School of Theology with a Master’s of Divinity Degree. In June of that year Metropolitan Anthony assigned Fr. Peter to Saint Nicholas Greek Orthodox Church in Northridge, California as a lay assistant. His responsibilities included teaching 5th and 7th grade religion courses at the St. Nicholas Parochial School, chanting in the Church, and serving in the Holy Altar. with Metropolitan Anthony, Fr. Peter and the community worked diligently to continue the beautification of the Church and grounds. The smaller wing of the Fellowship Hall was converted to classrooms for Sunday and Greek School classes; further iconography and stained glass windows were added to the dome and side walls of the Church; and the Wednesday Evening Paraklesis and Bible Study attendance grew substantially in attendance. After two years at the Shrine and Parish of Saint Nectarios, Metropolitan Gerasimos, assigned Fr. Peter to Saint Anthony in Pasadena. Fr. Peter was to pastor his new community with the assistance and companionship of his dear friend and brother in Christ, Fr. Efstathios Mylonas, who hoped to enjoy a blessed retirement with his family and community. However, Fr. Mylonas was called to meet his Lord shortly before Fr. Peter’s first Sunday. With heavy hearts, Metropolitan Gerasimos, Fr. Peter Stratos, Fr. Spencer Kezios, 38 more priests from our Metropolis, and hundreds in attendance, laid their brother to rest. And with this unexpected beginning, Fr. 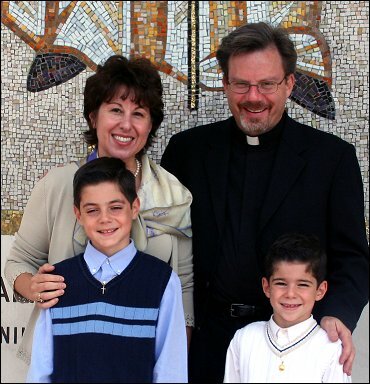 Peter and his young family embark on a new and even more meaningful chapter in their service to Christ’s Holy Church. Fr. 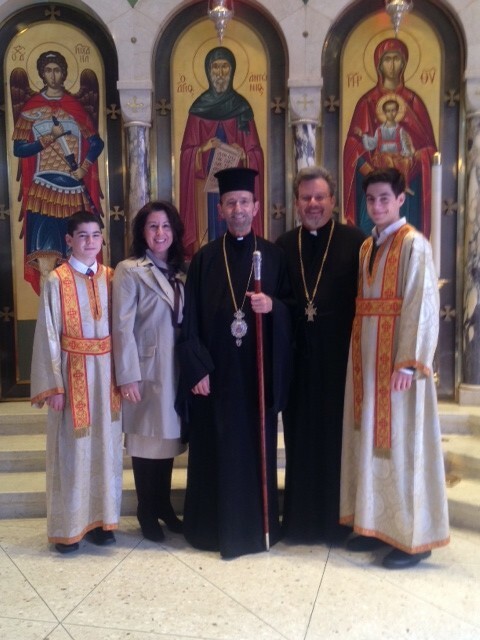 Christopher is currently the associate pastor for Saint Anthony Greek Orthodox Church. Fr. Christopher was born on November 1st, 1986 to Fr. James and Presbytera Barbara Retelas in Boston, MA while his father was finishing studies at Holy Cross Greek Orthodox School of Theology. He is the youngest of three siblings, with an older sister, Presbytera Angela Sotiras, and an older brother, Nicholas Retelas. Having been raised in an Orthodox priest’s household, this led to he and his family moving around a bit throughout his childhood and adolescence. From Boston, once his father graduated from Holy Cross Greek Orthodox School of Theology, they moved to San Francisco, CA where his father served as an assistant at the Annunciation Cathedral. Some three years later, they moved to Castro Valley when Fr. James became the Proistamenos at the church of The Resurrection. Four years later, the Retelas family moved to Portland, OR where Fr. James served at the parish of Holy Trinity (now Cathedral) until the year 2005, when they moved to Sacramento. Growing up in these different communities offered Fr. Christopher the opportunity to be involved in many different ways. Through high school, he was involved with GOYA, altar boys, summer camps, as well as danced in different Greek folk dance groups. While in college, Fr. Christopher was very involved with both dancing and directing various Greek folk dance groups in Sacramento. He also grew more and more involved with summer camp during this time. It was especially his involvement with camping ministries (specifically Camp Angelos, Ionian Village, and St. Nicholas Ranch) that truly grew the desire for him to pursue a life of service to the Orthodox Church. One of the most profound summer camp experiences for Fr. Chris of course came in the summer of 2009, when he had the opportunity to work as a staff member at the Ionian Village summer camp in Greece. This is where he not only felt a greater calling to his vocation in the Church, but it is also where he met his bride-to-be, Kalli (Kalliope), another PK from the community of New Rochelle, NY. After graduating from California State University Sacramento in May 2010 with a Bachelor of Science degree in Business Administration, Fr. Chris moved to New York so that he could be closer to Kalli, and he worked for two years as a project estimator for Manhattan’s largest Mechanical/HVAC contracting firm, PJ Mechanical Corp. It was during his time working in New York that Fr. Chris really started considering and praying a great deal about pursuing his vocation in the priesthood, and a life of service to the Church. Finally, in the fall of 2012, with the blessing and guidance of Metropolitan Gerasimos of San Francisco, he enrolled and started his first semester of studies as a seminarian at Holy Cross Greek Orthodox School of Theology. In his final year of studies at Holy Cross, he and Presbytera Kalli welcomed their daughter, Asimina Barbara, into the world on September 24th, 2015. 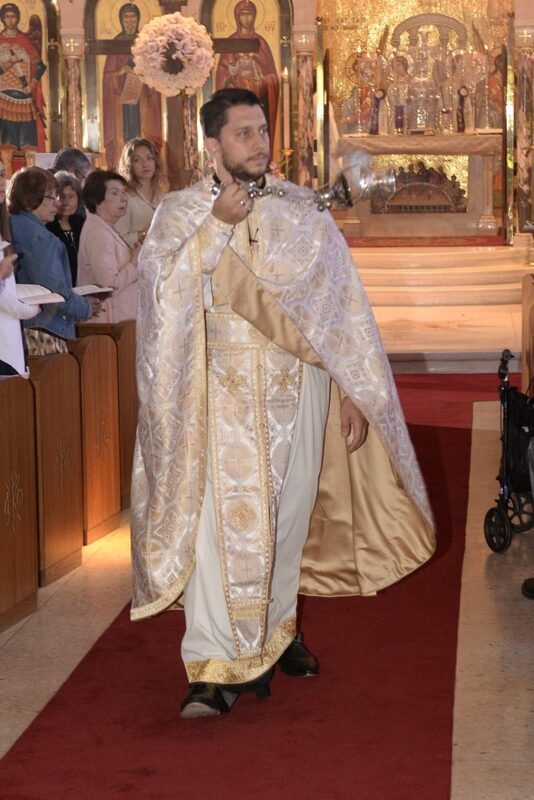 And in his final semester of his senior year, he was ordained by His Eminence Metropolitan Gerasimos to the order of the Holy Diaconate, at the Annunciation Church in Sacramento, on March 27th, 2016, the Sunday of St. Gregory Palamas. Fr. Chris graduated from Holy Cross Greek Orthodox School of Theology with High Distinction on May 21st, 2016 with a Master of Divinity degree. Shortly thereafter, Fr. 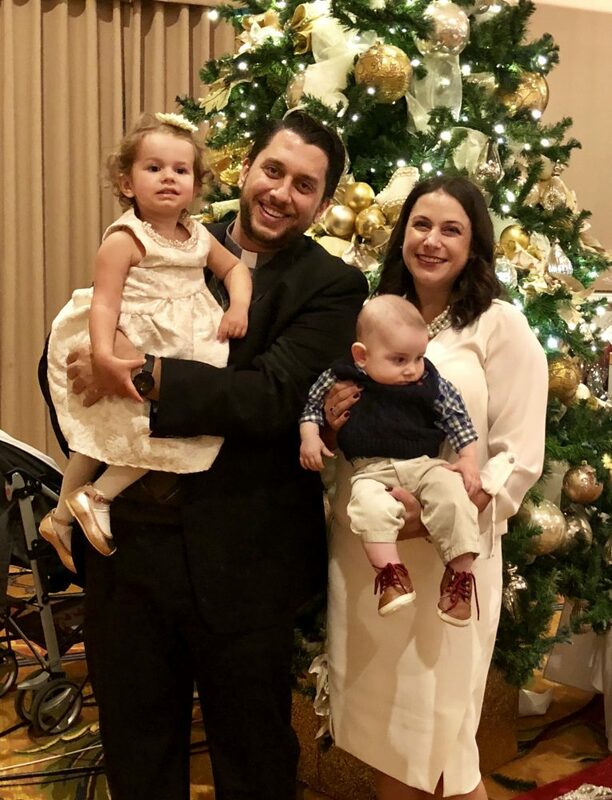 Chris was assigned to be the associate pastor at Saint Anthony effective August 1st, 2016, where he and his family have been welcomed and overjoyed to be a part of such a dynamic and beautiful parish family. After just over four months of serving the parish of St. Anthony as a Deacon, Fr. Chris was ordained to the Holy Priesthood by the hands of Metropolitan Gerasimos on Sunday December 11th, 2016 with many family and friends supporting and praying for him as he began his ministry as a Presbyter in Christ’s Vineyard. The Retelas family expanded once again when Fr. Chris and Presbytera Kalli welcomed their son Demetri Christopher into the world on June 20th, 2017. Fr. 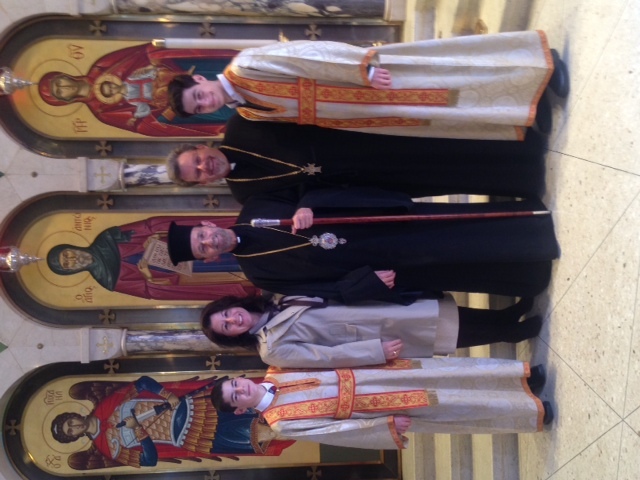 Chris with Metropolitan Gerasimos, celebrating clergy, and family on his ordination day.